Want a garden shed delivered in Perth? We have pickup depots here where if happy to collect, we ship from our factory to these depots. We offer home deliver too. 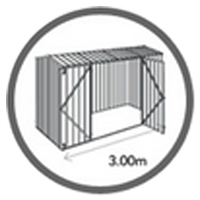 For pricing, add a shed to the cart and enter your postcode. or Go to our Shipping page and enter your postcode to find the closest depot to you. All our garden sheds are dispatched in normally 3-5 business days from order. We email your Order Receipt. We email the depot delivery address and phone number in Sydney. We email the date the truck is collecting your shed - Dispatch date. We email the Tracking code to keep tabs of where the truck is once collected. On arrival at the depot, you get a call/message to let you know it is ready for pickup. For home delivery option, you get a call/message to arrange a suitable time to deliver your shed to your specified address. If there are any issues with parts or even damage in transport, we will replace those items at no cost to you. So feel comfort in shopping for garden sheds in Western Australia or anywhere in Australia with gardenshed.com.au.